Jewelry is considered a luxury for most people, and so many consider it a rare but thoughtful purchase. This makes the gifting of jewelry a truly generous and sentimental act. Frank Pollak & Sons knows the value in gifting a unique piece of vintage or modern jewelry, and we want to encourage you to find value in this sentimental act, too. If you’re like any of us, then you know someone who has lived their life completely selfless. This person is usually a relative, like a mother, an aunt, or a grandmother. When was the last time your mother, even your wife, bought a piece of jewelry for herself? When does she have the time? There are people in our lives that go above and beyond for us, so why wouldn’t we do the same for them? Jewelry is ageless in that it can endure the trials of time. It can also be worn by anybody, but not everybody. We say not everybody because only you know a perfect someone whose wrist would look exceptionally stunning in a gold and diamond tennis bracelet. And the person who can wear the tennis bracelet may not be able to wear a Columbian emerald on their finger. Maybe the tennis bracelet would be perfect for your mother-in-law and the ring for your wife. 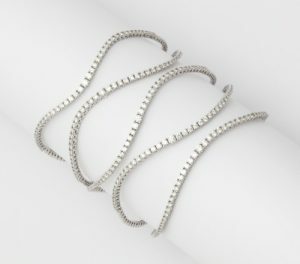 There is a style of jewelry out there that suits everyone’s unique personality. Jewelry is a sentiment passed down through the ages. This makes it a permanent fixture in our families. Jewelry stirs conversation. It unfurls memories and connects people through stories that are also passed down from generation to generation, and will exist long after we are gone. Do you have a birthday or special event coming up? Frank Pollak & Sons may be able to help you express your sentiment. Contact us today.